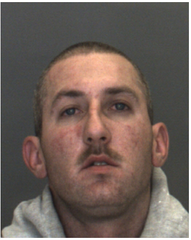 On December 15, 2018, at approximately 7:30pm, Deputy Joseph Mora stopped a vehicle for California Vehicle Code violations near the Chevron Service Station on Highway 138 and Mountain Road in Pinion Hills. During the traffic stop, both the driver, Alan Cascarini ,and passenger, Chelzi Seaman, of Phelan appeared to be under the influence of a controlled substance and were arrested. 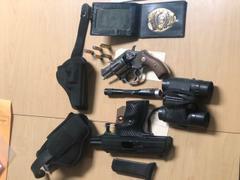 During a search of the vehicle, two firearms and a Building Inspector’s Badge, which is believed to be stolen, were located inside the vehicle. Cascarini provided a false name to Mora but was later positively identified and found to be on Parole with a no bail warrant for his arrest for absconding. Cascarini and Seaman were both arrested and booked at High Desert Detention Center. Due to the possession of the badge and firearms, anyone believed to be a victim of false identification of a peace officer are urged to contact Deputy Mora at the Phelan Sheriff’s Station. Anyone with information regarding this crime is urged to contact Deputy Mora at Victor Valley Sheriff’s Station, Phelan Sub-Station, (760) 995-8781. Persons wishing to remain anonymous can report information to WeTip by calling 1-800-78-CRIME, or by accessing the website at www.wetip.com.